Denver airport is weird. 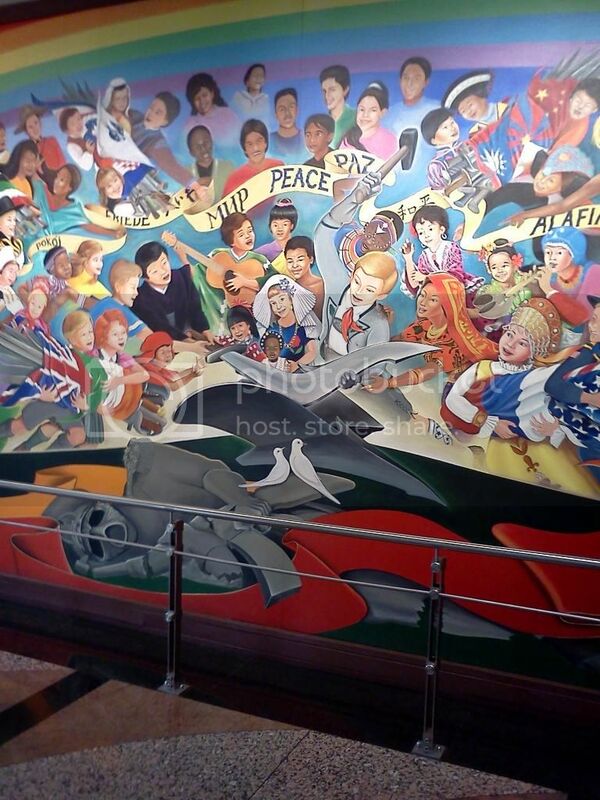 The murals are weird and their located in baggage claim where everybody goes to pick up their luggage. 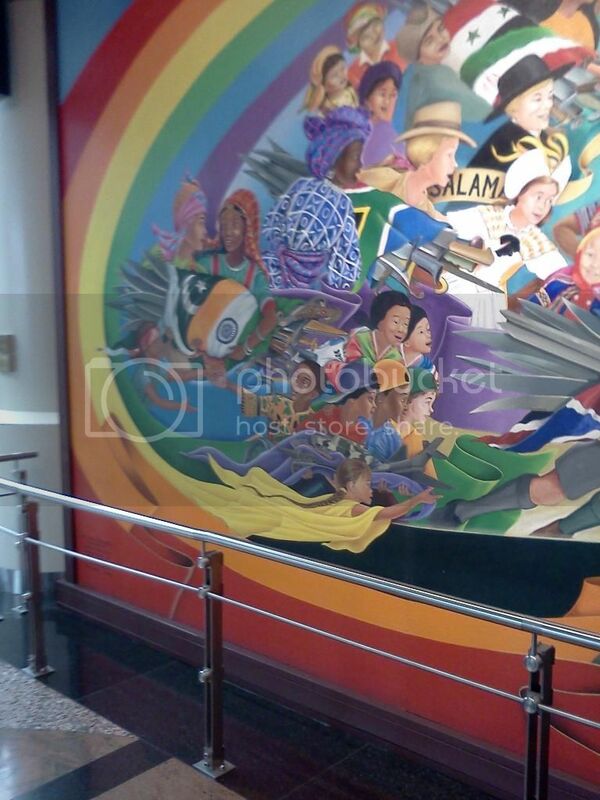 The mural has two sides. One side is dark, scary, and very sinister and the other side shows all the children of the world giving up their weapons with a smile. One little African girl is dressed in a tic tac toe checkerboard reminding me of the movie about Joshua the computer who learned nobody wins in a nuclear war scenario in War Games. Lots of Freemasonry imagery within the mural and the Blue tic tac toe board is one. 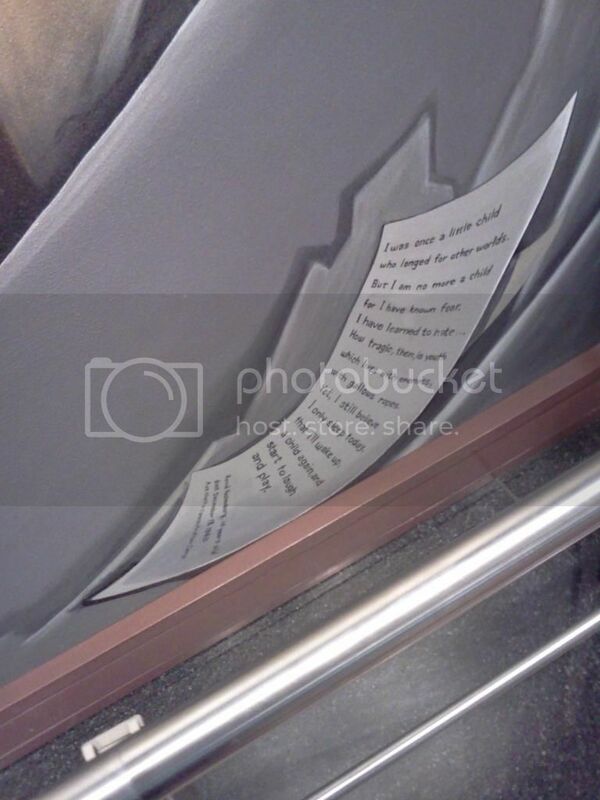 A paper lies in the corner of the poem written by a young child who died at Auschwitz. Lots of flags of different colors have wrapped with inside them weapons and the innocent children hand them over with a smile. The message seems to be all nations will learn a lesson in WWIII and turn over their weapons so peace can come to all Earth. Hit the link and you will see the tic tac toe board. 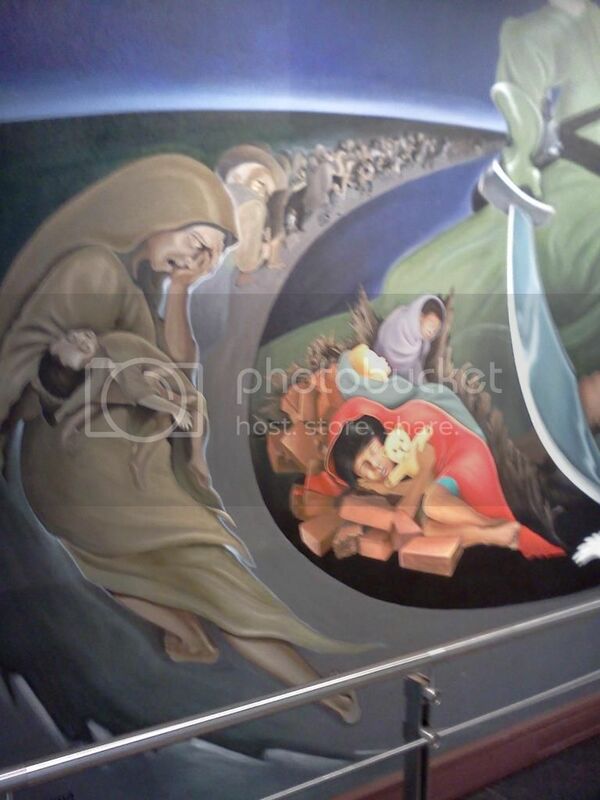 They symbolism of the mural continues with a scimitar and a very scary giant dressed in a dark gas mask. He is surrounded by death and lines of people dying. A gas mask brings to mind chemical and nuclear weapons. Interesting fact is that Colorado had the Rocky Mountain Arsenal. It was there America worked on biological and chemical weapons such as sarin gas. A superfund was enacted to clean up the site. I wondered if Jimenez knew about it. The scimitar is an interesting symbol with a reference to the MidEast and the dark scary guy wields it. The scimitar is a symbol used by the Scottish Rite Freemasons and the scary dark fello is a seven star general. It surprises me that he would be connected with the number seven which is a heavenly number. Is this dark Anti-Christ doing heavens bidding from the Bible’s revelations? A blond haired European boy uses a black anvil and a hammer to forge a new scimitar out of the old. 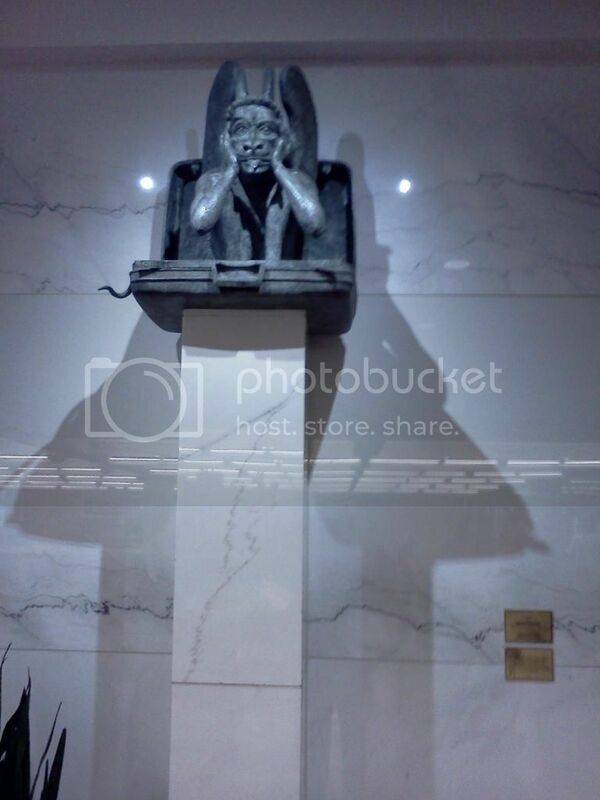 A black anvil is another symbol in Freemasonry. The hammer seems to be a reference to Thor’s hammer. A Nordic pagan god Thor wielded the hammer which produced lightening tornados and major storms. He ruled in the land of Asgaard called the “Land of Rainbows.” All around the children of the world is a rainbow of colors. The chemical weapons master is now buried and we see a new weapon forged. A new order emerges and the scimitar bends to Thor’s hammer. Fascinating imagery and I’m glad I saw it with my own eyes. The logistics of Denver Airport is weird and NOT convenient. My car rental bus shuttle drove about twenty minutes to reach my rental car. I’m not the only one. As I’m seated on the shuttle bus, I wonder why hotels and car rentals aren’t closer. My hotel is twenty five minutes away and it’s one of the closest Denver hotels. Why are there so many thousands of acres empty of any construction? Denver airport is surrounded by acres of land which are empty of any buildings. One construction project is being performed near Denver airport and it is a hotel. The Westin hotel and transport center is being built there. I guess some recognized the obvious and decided to build a transit system too to open in 2016. Yet the fact remains Denver airport is surrounded by what appears empty land and I’m wondering why? Notre Dame Chartres has one of the largest crypts in France. Many of the gothic cathedrals contain the Black Madonna’s which many relate to the Egyptian worship of Isis and baby Horus. The cathedrals were built during the Crusades where the Templar Knights fought in the Holy Land. War in the Mideast is increasing and causing instability. 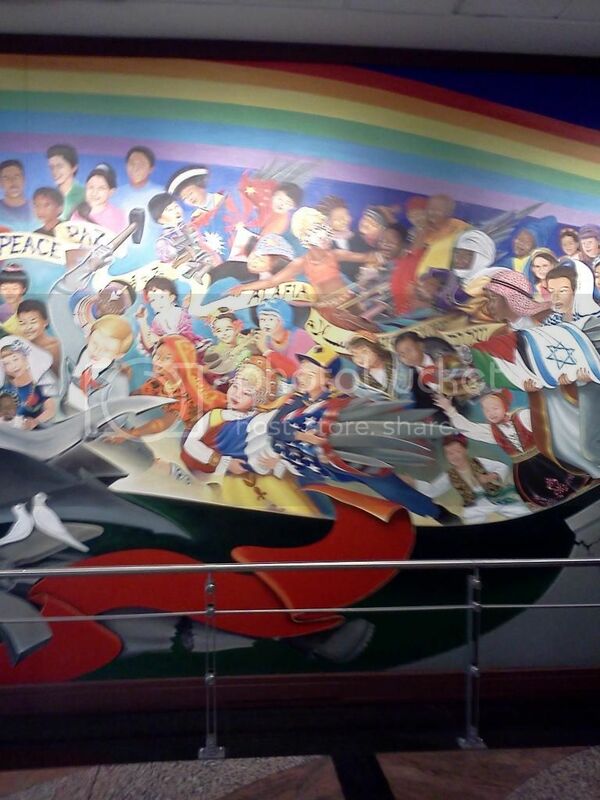 Denver airport’s mural and gargoyle may be prophetic. Is it a coincidence or is there a connection to what we are facing a possibility of World War III in our future. Did Jimenez give us a warning?